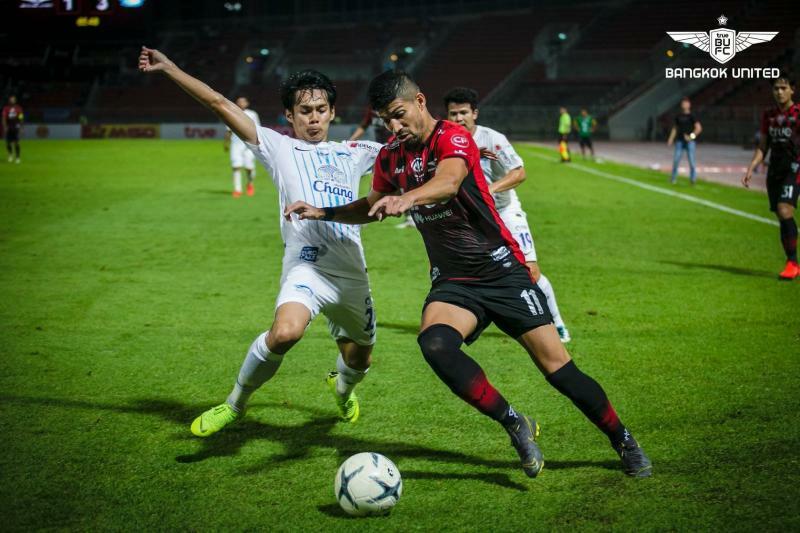 Bangkok United hosted Chonburi at the Thammasat Stadium on Wednesday night, eager to bounce back after a loss to Buriram and a draw against Nakhon Ratchasima in their last two games. However, despite the hosts taking charge of the game, it was the visitors that struck first. Brazilian forward Lukian found the net after 27 minutes courtesy of a wicked deflection which left goalkeeper Michael Falkesgaard helpless. The situation would soon get even worse for the hosts as Phanuphong Phonsa found the net from range, helped again by a deflection to double Chonburi’s advantage with the half-time whistle beckoning. Bangkok United came flying out of the blocks to half the deficit from the penalty spot, courtesy of Nelson Bonilla. However, Chonburi were able to re-establish their two-goal lead mere moments later through a second from Lukian, something later described as a “turning point” by coach Mano Polking. The Sharks squandered an opportunity to kill the game from the penalty spot in the 77th minute, giving the hosts hope that they could still make the most of the remaining 13 minutes despite being reduced to 10 men. However, Chonburi would finally kill of the game as Myanmar international Sithu Aung found the net to make it 4-2 to the visitors. “If we play this way every game, I can assure you, we will win more games than we will lose” coach Polking stated after the match. However, the coach was quick to admit that this weekend’s clash against Suphanburi is now a must-win if they hope to keep pace with the league leaders. Elsewhere, Port returned to form with a 4-1 victory over Trat, courtesy of goals from Pakorn Prempak, Arthit Butjinda and a brace from Sergio Suarez. Buriram United was held to a 0-0 draw by Chiangrai at home, but the point was sufficient to take the Thunder Castle back to the top of the table. The defending champions have now collected 12 points from their opening six games, and are one of only two sides (along with Sukhothai FC) who are yet to lose this season. Lastly, Muangthong United’s woes were compounded by a second abysmal defeat in just four days. Chainat Hornbill, who had previously been winless and rooted to the bottom, managed to break past the Kirin’s defense to score three without reply. Goals from Chatri Rattanawong, Chatchai Koomphaya, and Laos international Soukaphone Vongchiengkham allowed the Hornbills to climb out of the relegation zone and jump to 11th in the table.